I have been playing about with creating my own base theme which I can use to easily roll out new sites quickly and easily for those who don't want to pay for a bespoke design. The main problem with this is ending up with one theme for all, to get around this with out having to do any development work is use Drupal's core colour module which allows the user to select the colours of certain areas. This will just show you the basic code that is required for use with a theme using the PHPTempalte engine with some comments on what the code is doing at parts. Sorry but I will be using the English spelling, too used to typing with the 'u'. 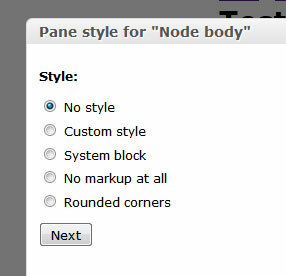 In Panels you can change the style of panes very easily using some presets from the Panels module. 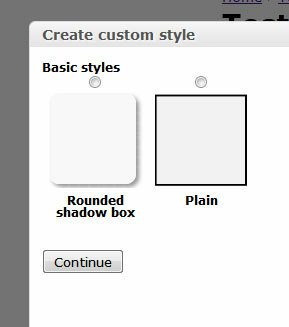 This tutorial will show you how to define your own styles as well as add a settings form to it so you can allow users to further configure the styling of the pane. This guide will show you how to make a bookmarking site similar to Delicious where you can add a URL with an optional description and tags which can then be searched on using the internal search or browse using tags. The following code snippet will provide a comma separated list of taxonomy terms for a given node. A new way to sell your house has just come up called Ownmove.com. They provide the same service as any other high street agent but only charge a small, one-off flat fee of £395 +VAT rather than 1.5% of the sale price which based on the average house price in the UK of £170,000 is over £2,000!! When creating an image gallery in Drupal using CCK/Fields the resulting output is just a string of divs resulting in a single column of images. This tutorial will show you how to use Views and Panels to override the standard node output to display the images of the gallery in a grid. Google have updated Chrome dev (15.0.849.0 dev-m) to re-enable one of the dev features that was taken out which is the Profile switcher located at the top left of the window. The following code gets a completely random page from Wikipedia and returns some HTML code with a link to the article. Visiting http://en.wikipedia.org/wiki/Special:Random in your browser will automatically redirect to a random article and the code takes in to account the redirect and gives you the information on the last page in the redirect. Not too much has changed from V2 to V3, but one major frustration was when using the 'click' event on a marker to open an info window, it didn't close when clicking another marker like it did on V2, as such you could potentially have a screen filled with lots of info windows.